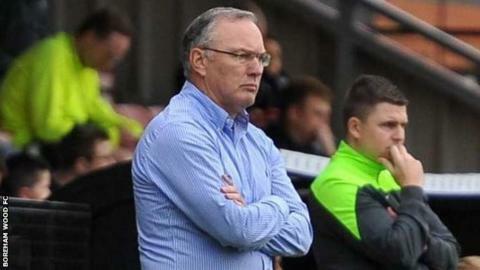 Ian Allinson has returned to Boreham Wood as director of football, just a month after resigning as manager. Allinson quit after being unable to balance his work commitments with the club's move to training during the day. His assistant Luke Garrard has taken over as manager, with Jason Goodliffe joining the coaching staff. "I have been speaking to the chairman and Luke over the past few days and both conversations went extremely well," Allinson told the club website. "I was very impressed with what both had to say and what was expected of me and how the position would fit in around my day job," added the 58-year-old former Arsenal winger, who works in the alcohol industry. Allinson had been in charge at the Hertfordshire club since May 2008, when they only just avoided relegation to Division One North of the Isthmian League. The former Arsenal and Colchester midfielder then guided them from the seventh tier of English football to promotion to the highest level outside of the Football League last season. "I'm so pleased that Ian has accepted our offer of such an important post," added chairman Danny Hunter. "The club has had to realise quickly that we are now a National League entity and one of the top 24 non-league clubs in the country. "As such we must get our management structure as well as our playing structure correct as we plan on staying up there with the big boys for some time yet."